While I was reading On the Line (buy at Amazon ), the semi-new cookbook/scrapbook from Le Bernardin's Eric Ripert, I kept saying to whoever was sitting near me how uncannily similar it is is to another book I've reviewed for Eat me daily: Ferran Adria's A Day at El Bulli. I should clarify. The review I wrote for Adria's massive volume was — generously speaking — something of a backhanded compliment; the book being, as it was, a precious few slim pages of completely fascinating culinary philosophy buried inside 500-plus pages of hagiographic snapshot portraiture and a handful of self-consciously ain't-I-a-genius recipes. On The Line isn't going to get a backhanded compliment from me. It's going to get a full-palm, see-i t-coming, forehand overhead smack-on compliment, because it is a goddamn fantastic book. Quality aside, what the two books have in common are surprisingly identical goals. 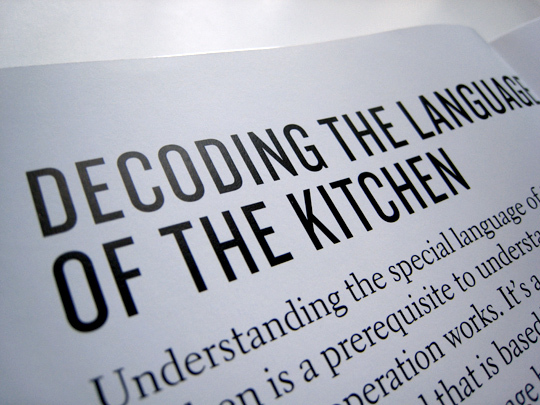 My criticisms for A Day at El Bulli are at their heart assaults on the structure of the book. But its aim — and the aim of On the Line — is one of fundamental nobility. Both books set out to give the reader unfettered access to a restaurant. 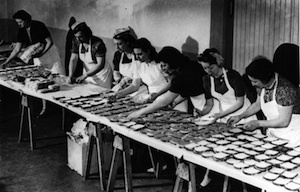 Even more than that, they try to paint that picture without myopically focusing on the celebrity chef, to instead show the long-form choreography that runs from pre-dawn delivery trucks to locking the doors for the night, to show the faces of the dozens of people filling dozens of roles, to illustrate the real muck and grime and glamour of getting that little plate of sole meunière into your tummy. That's an extraordinary idea, the portrait of the restaurant as a living creature. Having read Adria's book first, it's hard for me to look at On the Line as its own entity and not bog down my assessment in comparisons. But indulge me with one particularly juicy example: Where Adria's timeline takes 528 pages to track the titular day, Ripert dispenses of it in eight, and does it better. 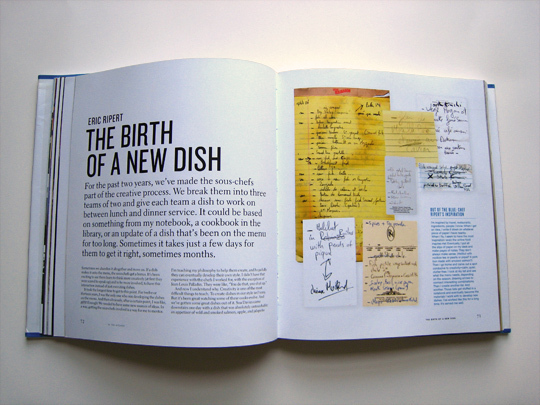 This saves him space to use his other 300 or so pages to list the contents of his pantries (also in A Day at El Bulli, as long as we're counting), profile his right-hand men (ditto), and scan in some handwritten recipe notes (ditto). But he also takes us on a minute-by-minute timeline of a dish, fills some pages with spectacularly photographed images of ingredients, details in microscopic resolution the various kitchen stations and their roles, lists and annotates the current menu, gives a shoutout to his favorite charity, notes how to get a VIP table — and that's not including the 85 pages of recipes at the back. That eight-page timeline? It scrolls along the bottom of pages otherwise dedicated to a multi-format barrage that runs from a glossary to a kitchen map to staff CVs to a list of essential tools. Any of it, taken on its own, is fascinating. All of it taken together — it's photorealism, it's documentary footage, it's virtual reality. Out of all these bits and pieces and moving parts, it's hard to identify a favorite. But if I had to pull one spread out to pin to the fridge, it'd be owner Maguy Le Coze's "Cardinal Sins," a comprehensive list of 129 verboten attitudes, actions, and tableaux. It's liberally peppered with exclamation points ("socializing with certain guests while ignoring others," "walking past items dropped on the floor," and "coffee in the saucer" merit 20, 15, and 19 respectively), and it wouldn't be out of place on the most crotchety of eGullet threads. In two pages it delivers both a microcosm of and harmonic counterpoint to the entire Le Bernardin philosophy: pefection is non-negotiable. This is a book for the short-attention-span gastronome, ADD-friendly chapters broken down further into digestible bites of information. For all that the listicle structure marks the death knell for magazine journalism, so help me god, it works here. There's just too much to take in about the runnings of a restaurant for it to function any other way. The clean design and multi-colored text help keep the pages from feeling overwhelming and cluttered, and each chapter has its own distinct feel. It's a book you could easily read all in one sitting, and could just as easily pick up and browse from week to week. Most wonderfully, this book positively overflows with joy. Ripert is the Ferris Bueller of the culinary world: everyone adores him, and it's because he just loves what he does so obviously. (On a whim, I googled "I hate Eric Ripert." It turned up zero results, and I'd bet that this publication will soon and forevermore be the only one.) 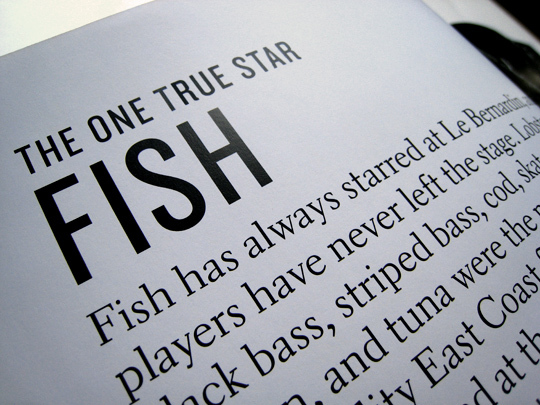 While Ripert and his co-author Christine Muhlke go to great pains to keep Ripert himself out of the limelight (his explicit presence in the book appears only in an introductory autobiography and in passing references to his kitchen dominion), his love for Le Bernardin, his employees, his employers, and his fish is pervasive and infectious. 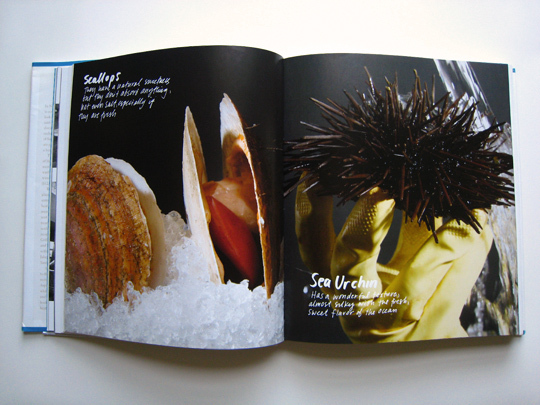 Reading A Day at El Bulli made me want to snag a reservation to the restaurant only so I could snidely turn it down. 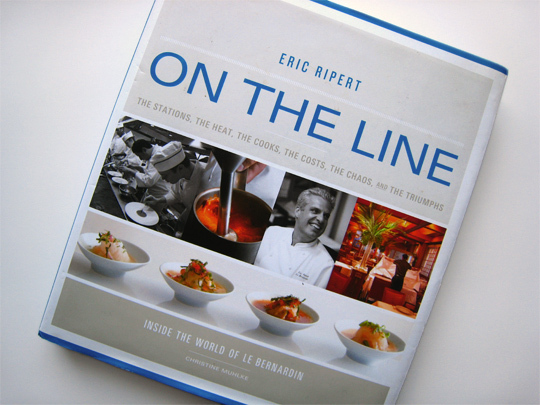 Reading On the Line makes me want to hop the subway to Le Bernardin and give Eric Ripert a big old hug.